The Pixelmator Team released Pixelmator 1.6 today, an update of the revolutionary GPU-powered image editing tool that provides everything needed to create, edit, and enhance still images. Available as a free software update, Pixelmator 1.6, codenamed Nucleus, adds major performance improvements, 64-bit support, layer groups, an Import feature, Flickr, Facebook and Picasa support, redesigned transform tools, and more. 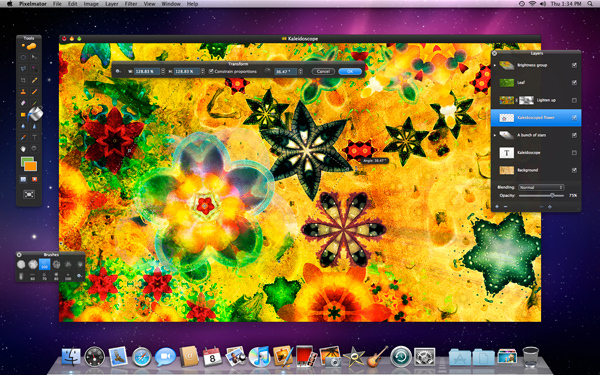 In addition to 64-bit support, which makes use of large amounts of RAM and increases performance, Pixelmator team engineers have polished almost every part of the Pixelmator foundation in order to allow users to take full advantage of the incredible power of graphics processing that is available in the Mac OS X 10.6 Snow Leopard. Thanks to these improvements, the overall performance of Pixelmator increased up to 40%; the launch time is now twice as fast and the ability to paint with Pixelmator is four times faster than it was in the previous version. Users will notice the overall performance improvements in nearly every function of the application. The new Layer Groups feature allows users to easily organize and manage layers in a Pixelmator composition. They can use groups to arrange their layers in a logical order and to reduce clutter in the Layers palette. Users can also use Layer Groups to apply blending modes, opacity, masks, or even transformations to multiple layers simultaneously. The new additions to Pixelmator’s Send To feature makes it easy to quickly publish images to online photo sharing sites such as Facebook, Flickr, and Picasa right from the application. The new Import feature allows quick and easy importing of images directly to Pixelmator from cameras, scanners, and multifunction devices such as camera/phones, printer/ scanners, and such as iPhones and iPads. Other new features in Pixelmator 1.6 Nucleus include redesigned transforming tools which are more precise and easier-to-use, Automator Actions for trimming and watermarking images, improved printing, minor user interface changes, compatibility improvements, and several bug fixes. Pixelmator 1.6 Nucleus is a free update for current Pixelmator users. Great update for a great app! Look forward to more! Now that’s a nice surprise for a Tuesday 🙂 – excellent stuff – group layer and the new transform options are really, really nice. Thanks a lot for this great update. How would you go about making a selection of a certain amount of exact pixels? For instance, let’s say I want a selection box of 16px x 92px. Where do I just type in the numbers and get me a 16px x 92px selection box? Or even better, combining percent with pixels. w: 100% h: 4px. This is really the main reason why I do not buy pixelmator, it lacks this basic feature on it’s selection tool which makes it more or less worthless for working with web design and such. Oh and did i mention the performance? I can’t say enough good things about layer groups! I also would like to see crop with absolute pixels. I often use to leave one value empty. So I can get a image cropped to 460 pixel width but flexible height. GREAT !!! Please add CMYK support. What do we need CMYK for in 2010? Color management is the way to go. Or do you want to store multiple versions for different printing methods and materials and do you always know what profile to choose to convert your RGB to CMYK? Yes, yes, yes !!! Well done ! Great release. Since version 1.0 I’ve believed in this software, and every new version make me more happy. I think I’m just one step to free space on my hd deleting PS. Have a nice day. Riccardo. Actually i use CMYK, and i personally know a lot of people that use it. Lack of CMYK in Pixelmator is huge mistake. Is anybody else having problems with the brush tool? Will you guys ever release this for Ubuntu, GIMP is ok, but nothing like this. Can I do a drop shadow yet? When I heard about the pending update, I bought my license to Pixelmator. Now that it’s here, I know I did the right thing. This thing flies! No more noticeable lag on the Wacom tablet. It’s everything I wanted, so thanks very much. Thanks for the continued tweaks & improvements. I love being able to avoid GIMP and Photoshop on all but the rarest occasions. I’ve totally written it by hand with Coda and all the graphics are done in Pixelmator! Yes i know it is in italian, but you can see some photos in “Foto” and “Concerti” but especially some digital art done in Pixelmator in “Arte”, and BTW Pixelmator 1.6 rocks! Best OS X image app just got even better, awesome! Still no letter spacing support? Other new features are great though, thanks very much! Just need a pen tool and I am 100% happy! Is there an estimated time when the manual will be updated to this new version? Other than that LOVE IT! Quick Drop Shadow – Select the layer you want to drop shadow, press Command j, this duplicates the layer. Press Command u and turn the Lightness slider all the way down. Nudge the image over and down to create the drop shadow effect. Use blur filter to feather the shadow. One small-ish bleat though: when did kaleidoscope stop drawing the image off screen? I used to enjoy noodling around with it, moving the centre spot around and then centering the result? Can this be brought back? To have it cut off the image means you then lose a lot of detail. Thanks for the drop shadow tip!!!! Sure, glad I could help. I love Pixelmator ! Thanks for the 1.6 !! Thanks for the brilliant update! And, do I spot a start in getting the best font tools :):):)? I just updated last week. But now, pixelmator is very buggy. You can`t even make things undo with “alt+z” it dosn`t work. Also when you group a few things together, the colour is left! “Waiting for Pentool” I saw that! It was a good movie but I liked the book better. En proximas actualizaciones serian interesante que se puedan previsualizar las fuentes. Saludos! In the next update would be interesting that you can preview fonts. Greetings! Like many before me have said and I will say it again beautiful product ! great release ! Im really hoping you guys developing Pixelmator could be more forthcoming about when or IF ? you will add LAYER STYLES to the mix. You could pretty much kill half of Adobe Photoshops market share overnight on MAC platform if you added LAYER STYLE support to your software, trust me there is a lot of anger about photoshop and how slow and bloated it has become, its a win win for you guys. So please do tell us will this feature come to us soon via your software ? Had to switch back to v.1.5. I use an older photo printer which works fine with Spider, but all my custom color adjustments are lost with v.1.6. As a result, I can’t use all my fine art printing papers. Not acceptable! I’d love to work with some of the new features, but they’re of no use if I can’t print. this is a nice soft! I just learned about Pixelmater two years ago and fell inlove with its kaleidoscope feature – even mounted a one woman show based on its capabilities. So I am upset that the kaleidoscope feature in the most recent launch is no longer what it used to be. I can’t even find it!! !, It was your best tool in my view. Anyone out there who knows a first rate kaleidescope effect? I have only found limp versions compared to what Pixelmator once offered. Stands back from the keyboard in amznameet! Thanks!